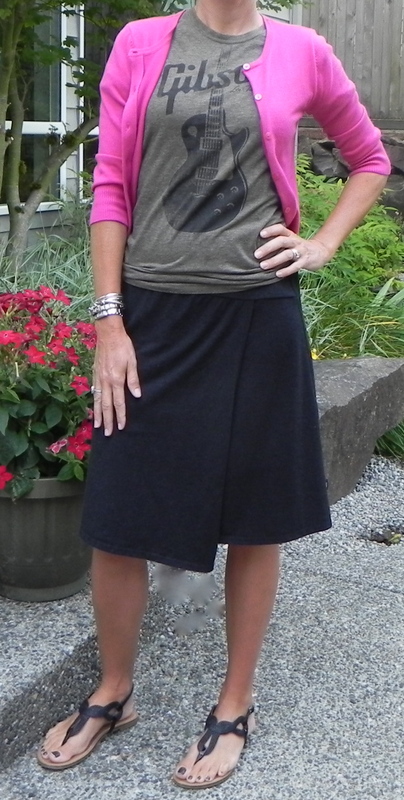 Casual skirt with t shirt- perfect for attending a sporting event. I almost melted yesterday! Seriously- it was so much hotter than I anticipated- and we lost our soccer game. Bummer. Since today I am lacrosse mom- and will be sitting outside for several hours- I have chosen a much cooler outfit. I am wearing one of my favorite skirts- you might even recognize it. It’s from North Face and it is made of bamboo- which means it is so incredibly soft and comfortable. It also has a cool hemline- which adds interest. On top I am wearing something totally different than my usual style- it’s a t shirt that I actually bought for my son- but it was too big! I think it’s perfect for today- it’s casual, but cool- and adds an unexpected twist to my entire look. I love the guitar on the front- sort of ‘rock and roll cool’. To bring back the ‘sweetness’ I layered a hot pink, ladylike cardigan. I will peal this off as soon as it gets warm. What do you think, would you wear this? Do I look ridiculous? I love the rock and roll t shirt. So out of my element! The cardigan can come off when it gets hot. I don’t ever wear them either- but thought it might be a fun change. Thanks for commenting! Send me a pic when you wear yours! I love the idea of this outfit, and I love the hot pink sweater with the black and olive. My only suggestion would be to get a more “fitted” t-shirt that isn’t so loose around your super skinny waist. That would totally rock!